The Roxbury Library Association has received a Spring-Fall 2019 New York Humanities Community Developed Adult Reading and Discussion Grant from New York Humanities. The R & D Program hosted by the Roxbury Library will offer adult participants the opportunity to explore the topic “Formed by Anger, Sustained by Hope: Making Community in Troubled Times,” devised by Roxbury resident Scholar-Facilitator Barry Seiler, through a series of thematically linked readings, including GOOD AND MAD by Rebecca Traister; BETWEEN THE WORLD AND ME by Ta-Nehisi Coates; ZEITOUN by Dave Eggers; THE TRUE AMERICAN by Anand Giridharadas; IN THE NEIGHBORHOOD by Peter Lovenheim; and HOPE IN THE DARK by Rebecca Solnit. 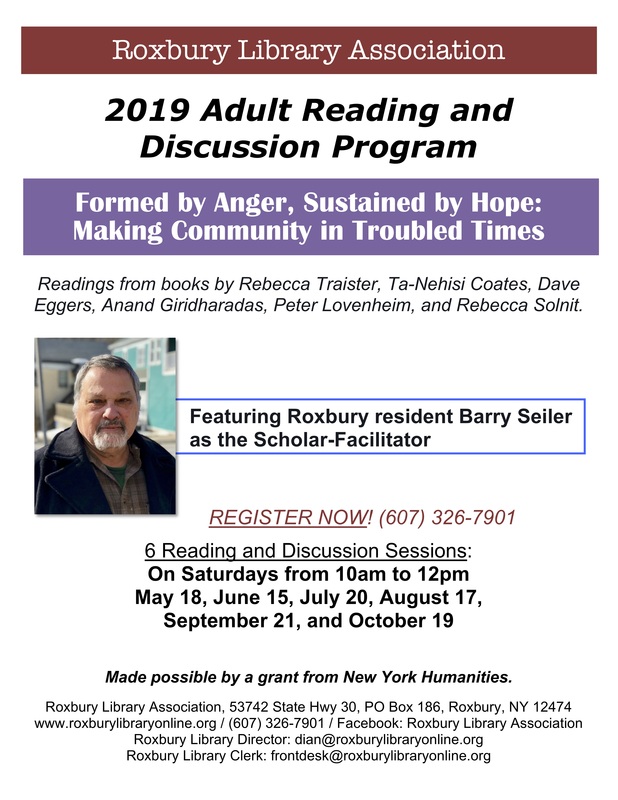 The Spring-Fall 2019 NYH Community Developed R & D Grant Program at the Roxbury Library will offer six reading and discussion sessions, all on Saturdays, from 10:00 a.m.-12:00 noon, on the following dates: May 18, 2019 (GOOD AND MAD); June 15, 2019 (BETWEEN THE WORLD AND ME); July 20, 2019 (ZEITOUN); August 17, 2019 (THE TRUE AMERICAN); September 21, 2019 (IN THE NEIGHBORHOOD); and October 19, 2019 (HOPE IN THE DARK). The RLA will provide copies of the Scholar-Facilitator’s NYH R & D book selections from the Four County Library System and from the Roxbury Library collection for R & D program participants’ use. To register for the Spring 2019 NYH R & D Grant Program at the Roxbury Library, please contact Roxbury Library Director Dian Seiler or Helen Faraci or Barbara Vigna, Roxbury Library Clerks, at (607)-326-7901. Located at 53742 State Highway 30, the Roxbury Library is directly opposite the town’s United Methodist Church on Main Street. On Saturday, December 1, 2018, from 9:30 a.m.-1:30 p.m., the Roxbury Library Association will hold its Annual Holiday Bazaar at the Roxbury Library. The RLA Annual Holiday Bazaar will offer holiday shoppers the opportunity to purchase quality RLA Thrift Shoppe merchandise, Irma Mae Griffin’s HISTORY OF THE TOWN OF ROXBURY, and 2018 RLA “Scrap Happy” quilt raffle tickets at $1.00 per ticket or at $5.00 for 6 tickets. Santa will be visiting the Roxbury Library from 10:00 a.m.-12:00 noon with holiday gifts for the children of Roxbury and neighboring communities. The RLA quilt raffle drawing for the 2018 RLA “Scrap Happy” quilt, expertly handcrafted by the Roxbury Library Quilters, will take place at 1:30 p.m., directly following the 2018 RLA Annual Holiday Bazaar. For further information about the 2018 RLA Annual Holiday Bazaar, please contact Roxbury Library Director Dian Seiler or the Roxbury Library Clerical Staff, Helen Faraci or Barbara Vigna, at (607)-326-7901. The RLA Thrift Shoppe Volunteer Staff and the Roxbury Library Staff welcome donations of new or gently used gift items to the 2018 RLA Annual Holiday Bazaar. Your generous contribution, donations, and enormous support have made this event possible and all proceeds from this event will help keep the lights on at our library. Thank you to all businesses and individuals that have contributed and donated to The Roxbury Library Association’s Third Silent Auction! The Roxbury Library Association (RLA) welcomes students in grades 1 through 7 to the July 2018 Summer Reading Program, which will begin on Monday, July 9, 2018. Featuring the NYS 2018 SRP theme “Libraries Rock,” sessions for the RLA 2018 SRP will take place at the Roxbury Library on Mondays, Wednesdays, and Thursdays, throughout the month of July 2018. To register a child or a young person in the RLA 2018 SRP, please contact RLA Summer Reading Program Coordinator Lorrayne Bolger at (607)-326-4957. 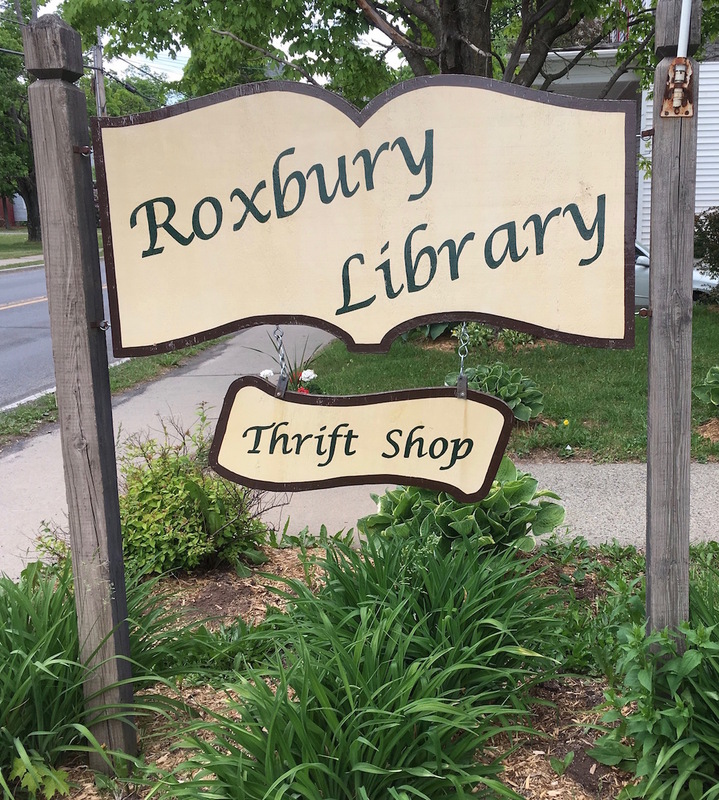 The Roxbury Library Association welcomes the public to the RLA’s Third Silent Auction on Saturday, July 7, 2018, from 9:30 a.m.-2:00 p.m., during the July 2018 Roxbury Summer Sidewalk Festival. The 2018 RLA Silent Auction will feature gift certificates, antiques, collectibles, framed photographs, framed paintings and drawings, furniture, wine and edibles, handcrafted quilts and handbags, and vintage items, generously donated by local individuals and area businesses. 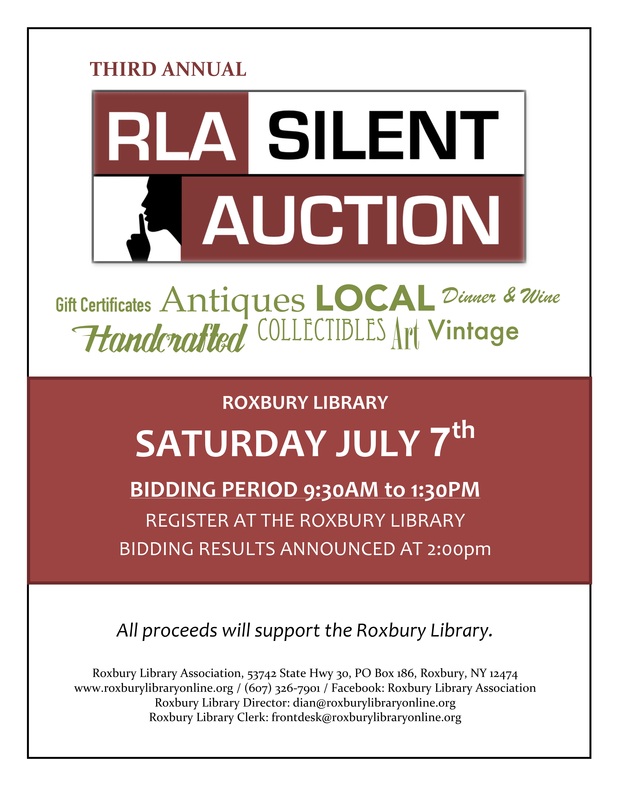 The silent auction bidding period on July 7th will be from 9:30 a.m. to 1:30 p.m., with the bidding results announcements scheduled for 2:00 p.m. Roxbury Library patrons and visitors may register for the 2018 RLA Silent Auction at the Roxbury Library circulation desk prior to the auction or on the July 7th auction day. The preview days for the 2018 RLA Silent Auction will be on Monday, July 2nd and on Thursday, July 5th, from 10:00 a.m. to 5:00 p.m., at the Roxbury Library. 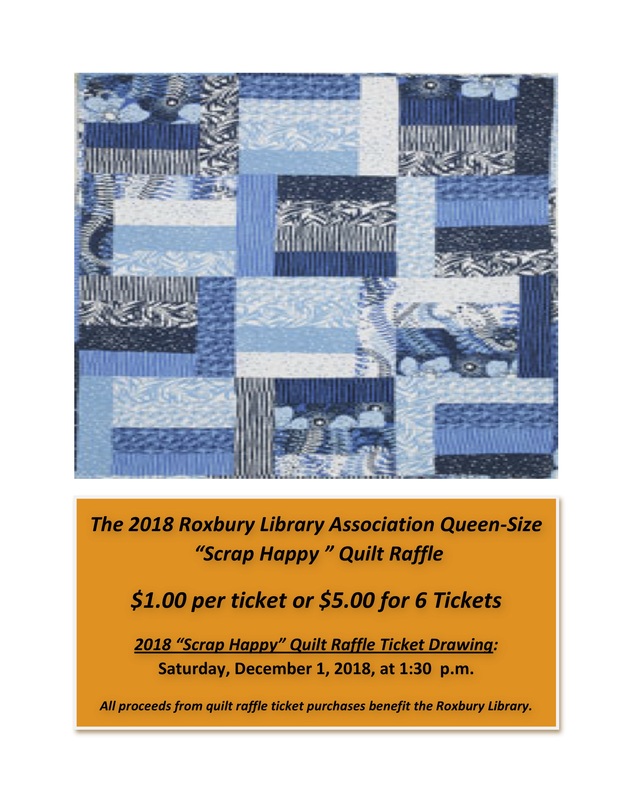 On the day of the July 2018 Roxbury Summer Sidewalk Festival, the RLA invites all library patrons and visitors to take advantage of special and regular RLA Thrift Shoppe sales and of the opportunities to purchase raffle tickets for the 2018 RLA queen-size “Scrap Happy” Quilt, expertly handcrafted by the Roxbury Library Quilters, and Irma Mae Griffin’s HISTORY OF THE TOWN OF ROXBURY. 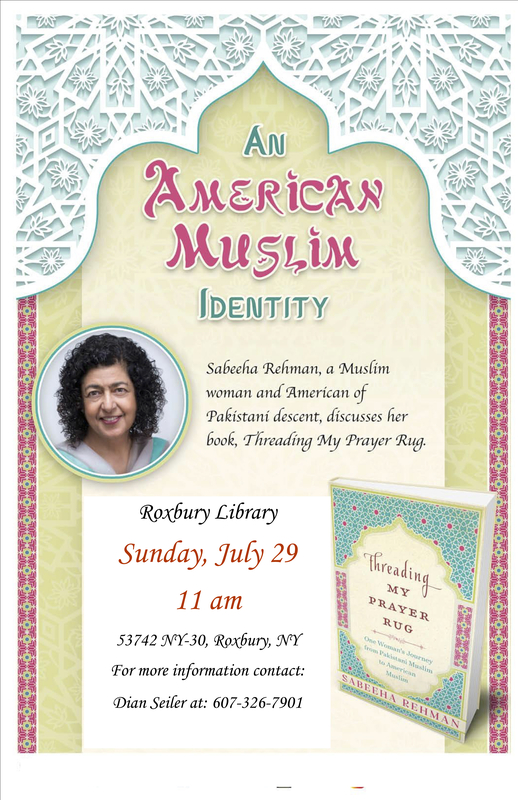 For more information about Roxbury Library events on July 7th, please contact Roxbury Library Director Dian Seiler or Roxbury Library Clerk Jennifer Fairbairn at (607)-326-7901. The Roxbury Library Association has received a Spring 2018 Adult Reading and Discussion Grant from New York Humanities. 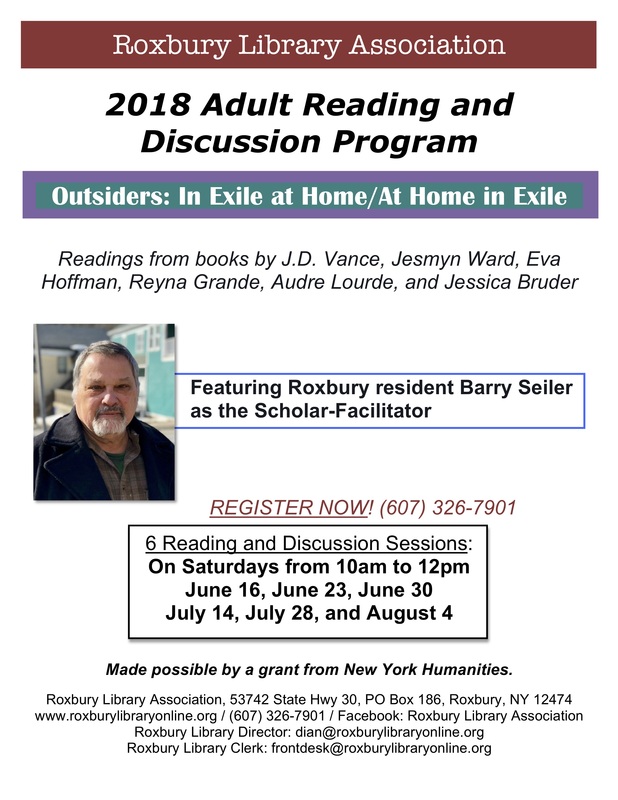 The R & D Program hosted by the Roxbury Library will offer adult participants the opportunity to explore the topic “Outsiders: In Exile at Home/At Home in Exile,” devised by Roxbury resident Scholar-Facilitator Barry Seiler, through a series of thematically linked nonfiction readings, including HILLBILLY ELEGY by J.D. Vance; MEN WE REAPED by Jesmyn Ward; LOST IN TRANSLATION by Eva Hoffman; THE DISTANCE BETWEEN US by Reyna Grande; ZAMI by Audre Lourde; and NOMADLAND by Jessica Bruder. The Spring 2018 NYH R & D Grant Program at the Roxbury Library will offer six reading and discussion sessions, all on Saturdays, from 10:00 a.m.-12:00 noon, on the following dates: June 16, 2018 (HILLBILLY ELEGY); June 23, 2018 (MEN WE REAPED); June 30, 2018 (LOST IN TRANSLATION); July 14, 2018 (THE DISTANCE BETWEEN US); July 28, 2018 (ZAMI); and August 4, 2018 (NOMADLAND). The RLA will provide copies of the Scholar-Facilitator’s NYH R & D book selections from the Four County Library System and from the Roxbury Library collection for R & D program participants’ use. To register for the Spring 2018 NYH R & D Grant Program at the Roxbury Library, please contact Roxbury Library Director Dian Seiler or Roxbury Library Clerk Jennifer Fairbairn at (607)-326-7901. 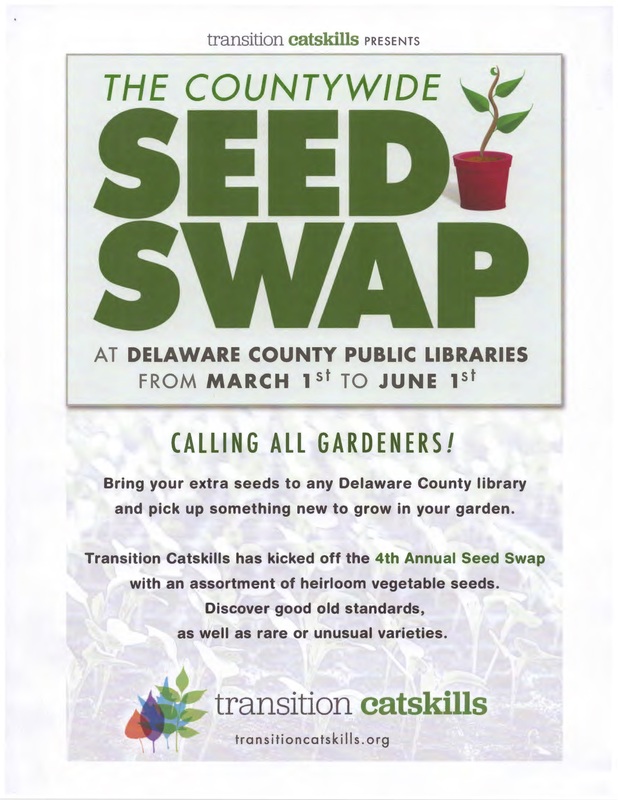 The Seed Swap is on!